Oceanfront duplex (west side) with 6 bedrooms and 6 full baths. Large living area, 3 televisions and 2 DVD players, Netflix service available with your password, HBO programming, stereo with CD player, wireless internet access, phone for local calling. 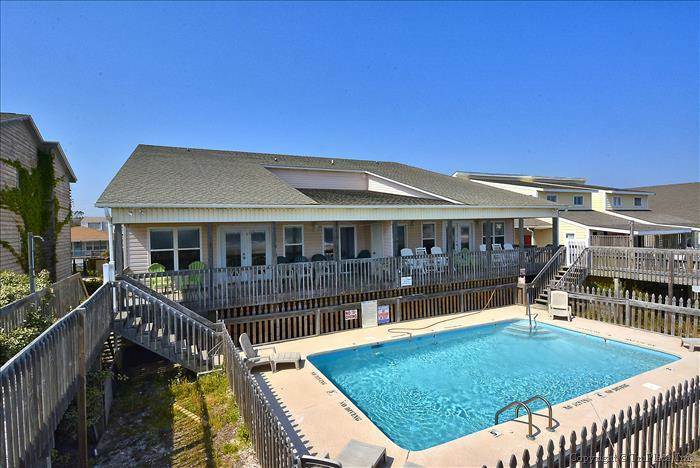 Fully equipped kitchen with dishwasher and microwave, Washer/Dryer, covered porch and sundeck, outside shower, private walkway to beach. Swimming Pool is shared with other side of the duplex. Blue Ribbon service included in rental rate, all bed and bath linens provided. 2016 Updates to include: new hard surface flooring on the first floor (living room and 3 bedrooms), updated dining room tables, new LED 'smart' televisions, resurfaced swimming pool, new lighting in the kitchen and living areas, and furniture updates in the living area. Sleeps 20. Downstairs: 2 Queens, 2 Doubles, King, Upstairs: King, 2 Queens, Queen/Double.